Health and Beauty Girl : New! Live Clean - All Natural Deodorants That Work! My favourite all-natural health and beauty brand, Live Clean, has finally come out with a deodorant! 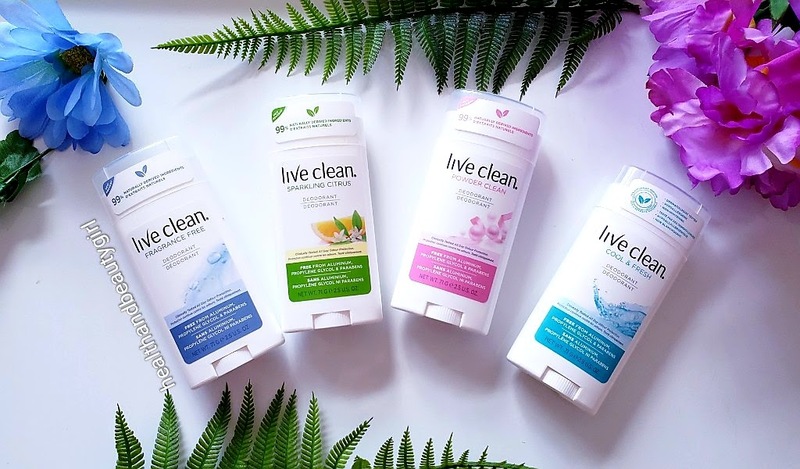 Many of us have been asking for Live Clean to create a deodorant, and it took some time, but if you know Live Clean like I do, they don't launch a product until they perfect it, and they definitely did just that! These deodorants are made with 99% naturally derived ingredients and are free from aluminium, propylene glycol, and parabens, and other harmful ingredients. They provide freshness, comfort, and all day odour control. Formulated to neutralize and combat odour naturally. Derived with baking soda, corn starch, soothing aloe, and vitamin E, this naturally derived formula is also enriched with certified organic parsley, rosemary and sage. They leave your underarms conditioned and fresh all day. My favourite is the Cool and Fresh scent which has a very fresh scent as the name implies. My partner's favourite is the Sparkling Citrus scent which I would say leans towards a grapefruit/orange scent and is a great unisex fragrance. The Powder Clean scent has a soft, clean scent with a hint of a baby powder scent. Lastly, there's the Fragrance Free option which is completely void of any scent, great for those who want to avoid any fragrance. I've been testing out this deodorant for almost 2 weeks, and I can attest to the claims that it offers all-day protection. Even after sweating and working all day, there is no detectable scent. I've even put it to the 24-hour test when I was too tired to shower one night and there was still zero odour the next day! I've been testing out natural deodorants for as long as I can remember and I can honestly say that these are hands down the best natural deodorants that I've ever tried for odour protection! I still perspire as these are not antiperspirants, but they do prevent odour from forming. The trouble with a lot of natural deodorants is that they're usually expensive and not easily accessible or they just don't work. This is why so many of us have been asking Live Clean to create a deodorant, they take away all of those factors. Live Clean claims that these deodorants provide all-day odour protection and I 100% agree with that claim! I am so happy to have found such an effective product that is also free of harmful chemicals, affordable, and accessible! These are the reasons why I love Live Clean Products so much. They've really knocked it outta the park with these new deodorants! I'm so happy that my search for "The One" is over! Products were provided free for review consideration. All opinions are my own. I know your love for Live Clean and these are truly amazing! I think you'll love them! I can't recommend them enough and so affordable!